Jay Ruiz was watching the news with his wife on September 13th, 2011 when suddenly video footage of a woman being attacked in Park Slope came on the air. Ruiz was shocked by the violent assault, her terrifying screams, and most disturbingly, the lack of anyone coming to her aid. Not the type to take such an event in stride, Ruiz was inspired to do something about it. “What if every woman was safely escorted home?” he said to his wife in their Prospect Heights home. The next night that is exactly what Ruiz did: he jumped on his bike and pedaled over to the subway station at Fourth Avenue and Ninth Street with a friend and held up a sign saying: Brooklyn Bike Patrol, including his name, phone number and e-mail address. “At first people thought we were crazy and didn’t know if we were good guys or bad guys up to no good,” said Ruiz a ten year veteran of the bike messenger business. As luck would have it, a News 12 van drove up and interviewed Ruiz about the Brooklyn Bike Patrol. Then only a few minutes later a reporter for the New York Daily News exited the train. She took a picture of Ruiz and wrote and accompanying story. Since then the BBP has become a reliable service, helping women to be and feel safe as they walk in their neighborhoods at night. The service began with 11 volunteers at 11 subway stations, but now they have enough bikers to cover 35 locations is many Brooklyn neighborhoods, including: Bed-Stuy, Carroll Gardens, Clinton Hill, Cobble Hill, Fort Greene, Kensington, Park Slope, Prospect Heights, Sunset Park, and Windsor Terrace. As of January 30th BBP added Borough Park to their area of coverage, including five of the stations along the D train line. 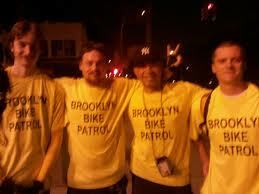 Volunteers to ride with the BBP can also get in touch. The hours of service are: Sunday through Thursday, 8 p.m. to midnight. Friday through Saturday, 8 p.m. to 3:30 a.m.